Flooding, drought, hurricanes, wildfires — extreme weather events, once infrequent, are becoming more common and powerful due to climate change. At the same time, growing numbers of people worldwide are moving to cities. That’s a dangerous combination, since urban populations are more at risk of disruption from the effects of global warming. Millions of people worldwide might be putting themselves at risk just because of where they live. But simply relocating populations at risk only gets us so far — for instance, relocating a subsistence-based fishing village inland would leave people without livelihoods, and sprawling cities into new developments would mean disrupting even more of our natural environment. We have to find a more sustainable long-term solution — homes hardy enough to survive more frequent extreme weather events, and with minimal carbon footprints to not make them worse. Skilled designers, architects, and engineers have been hard at work, looking for a solution that tries to tackle both of these issues: develop homes that can survive future conditions on Earth, without damaging our environment even further. Here are some of the most creative ways we can adapt where and how we live to mitigate the negative consequences of climate change. Seasteading, the practice of establishing permanent settlements on structures located in areas of sea outside the jurisdiction of any country, is becoming more mainstream. In April 2017, the term was added to the Oxford English Dictionary. It marks the emergence of a new way of living that takes advantage of the other 71% of our planet’s surface — the ocean. Sea levels are rising even faster than experts had predicted, so private development firms, governments, and researchers have turned their attention to making the oceans our new home. The open water, distant from any nearby land, isn’t the most inviting or accessible place to settle, but as polar ice caps melt and more populated areas begin to flood, we might start running out of space on dry land. Many projects, some in progress and some already complete, have made use of the ocean by creating new land with sand or landfill. Most notably, land reclamation sites in the United Arab Emirates such as Palm Jumeirah in Dubai, have expanded habitable territory at an enormous scale. But simply adding more land doesn’t address the incoming tide and rising sea levels. The alternative: settling on the surface of the water on a floating island. The concept of settling on water is not new: the Uros people of Lake Titicaca, Peru started building their villages hundreds of years ago on floating, interconnected rafts of highly buoyant reeds. 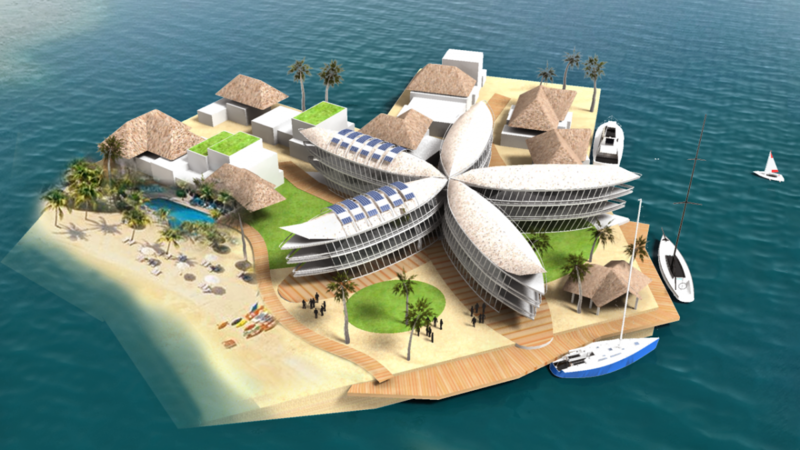 The Seasteading Institute, a global team of biologists, engineers, investors, and environmentalists, banded together in 2008 to take on an ambitious goal: to design a modular, fully-functioning, and floating “eco-village.” The Floating Island Project would use concrete structure to float platforms that are also chained to the ocean bed. The islands could move around and be rearranged according to the needs of the island’s inhabitants. Its initial design would allow 250 people to live on 11 platforms, and more could be added later. Rather than living independently of the mainland, the Floating Island is designed for protected waters and would still be accessible from the shore. In January, the government of French Polynesia, a collection of 118 islands stretching across more than 2,000 km (1,200 miles) across the South Pacific Ocean, signed a memorandum with the Seasteading Institute and its affiliated Singapore-based startup Blue Frontiers to start the development of a floating island pilot project as soon as 2020. The Institute will use Tahiti’s floating village to test a range of sustainable technologies, like the use of recycled plastics and local coconut fibers as building materials. It will also show whether people can actually live this way, or if ecotourism is a viable basis for its local economy. The floating islands address a particularly pressing need for French Polynesia — the narrow islands’ proximity to sea level makes them vulnerable to sea level rise over the next century. A recent model predicted that 5 to 12 percent of islands could be totally submerged by 2100. Thousands of inhabitants live mere meters above sea level, so disaster could strike at any point. And it’s not just the rising sea level that is threatening them — more violent and frequent storms caused by the warming seas could pose an even more serious threat. With such a great number of agents and interests, input from Polynesians themselves could get lost. The ambitious plan will only work if local people consider their social and economic needs and include those in the design of the island. 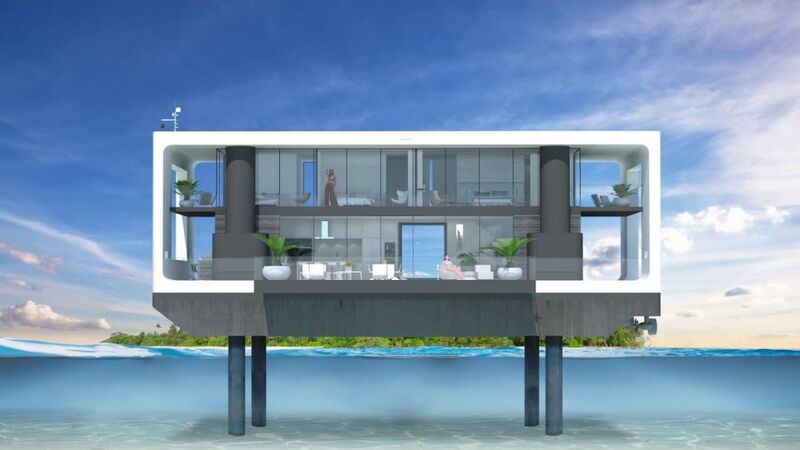 Being anchored to the ocean floor atop a floating platform means that floating island communities are fully exposed to all kinds of bad weather. Even when anchored in calmer, shallower waters, strong winds and rain could have devastating effects on the islands. Access to basic necessities like fresh water and fuel is another big challenge — it will be difficult for floating communities to fully shed their dependency on mainland support in the long term. A move to the ocean might not just be for those who need it most — it could be for those seeking luxury as well. The Miami-based design company Arkup promises solar-powered “luxury livable yachts” for those with $2 million to $3 million to spare. Arkup’s rectangular, 75-foot vessels feature four bedrooms and more than 371 square meters (4,000 square feet) of luxury. Electric thrusters on the underside propel the yacht. Four 40-foot hydraulic spuds (long, pipe-shaped protrusions) at every corner anchor it in water up to 20 feet deep and lift it above the surface of the ocean. The company promises to bring state-of-the-art, environmentally-friendly technologies to its livable yacht. The vessel is entirely solar-powered and contains its own water purification systems and local waste management, allowing the vessel to exist fully off the grid. More intense storms of the future likely won’t pose a problem, either. Architect and Arkup partner Koen Olthuis told Business Insider the livable yacht could withstand 251 kilometer-per-hour (156 mile-per-hour) winds, speeds equivalent to a Category 4 hurricane. While the upfront costs for such a novel way of life are quite steep, a renewable energy source and rainwater harvesting means owners won’t have to pay any utility bills. And depending on the jurisdiction, they might not have to pay any property taxes, either. Climate change will likely make hurricanes more intense. The 2017 hurricane season fits that trend — though there weren’t more storms than usual, more of them (10 to be exact) strengthened to become hurricanes, matching a 124-year-old record. Reconstructing communities devastated by these storms is slow and expensive — in August, Hurricane Harvey caused $180 billion in damage, ranking it among the most costly natural disasters in U.S. history. 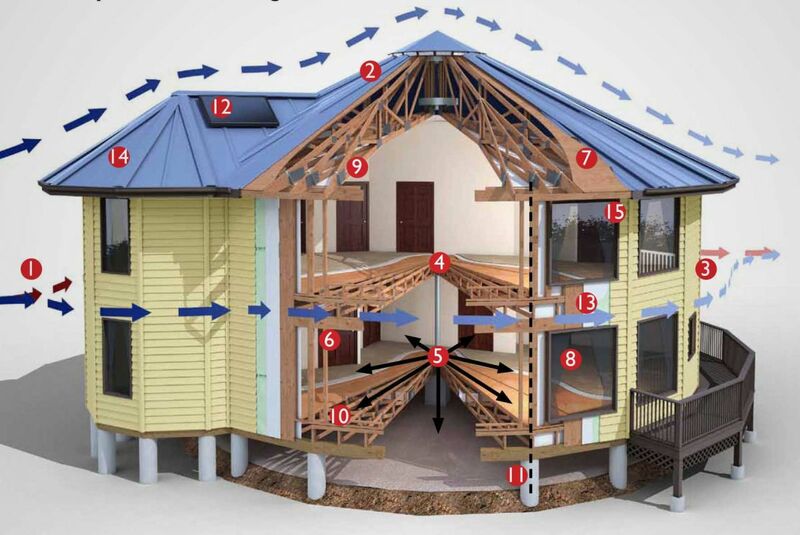 So it’s clear that homes need to be constructed to be more durable, especially in hurricane-prone regions. Prefabricated home design company Deltec Homes is creating living quarters intended to withstand disastrous storms. Deltec’s model house is entirely circular, transferring wind forces around the structure instead of concentrating them on one side. The internal trusses holding up the floors radiate outwards from the center of the building like spokes on a wheel, further reinforcing the structure. Machine-treated framing lumber used in Deltec’s hurricane homes can bear 2,400 pounds per square inch, making it twice as durable as typical framing material. The windows are made of extra-strong impact glass to keep bad weather out. Contrary to conventional vinyl or aluminum framed windows, hurricane-resistant impact windows are able to withstand winds up to 320 kilometers per hour (200 miles per hour). The glass is treated to prevent it from shattering into sharp pieces, one of the biggest hazards to humans when hurricane winds damage buildings. Each home costs between $225,000 and $320,000 total, depending on its size. Deltec has built over 5,000 prefab round homes in over 30 countries. So far, none has been destroyed by severe weather. “I think it’s inevitable, whether that’s 10 years or 50 years from now, that the vast majority of houses eventually get built this way,” Deltec president Steve Linton tells Curbed. Moving to the ocean or warding off severe weather is only one way to address climate change. Conventional home construction itself demands energy and materials that exacerbate the effects of climate change. Reducing the impact of a new home by opting for environment-friendly materials and renewable energy sources is another great way to mitigate the effects of global warming. For instance, builders can opt for using recycled or natural materials, such as straw, untreated lumber, and non-toxic paints and finishes. Simon Dale, a homeowner and builder from the United Kingdom, pushed the concept of a low-impact home to its extreme. 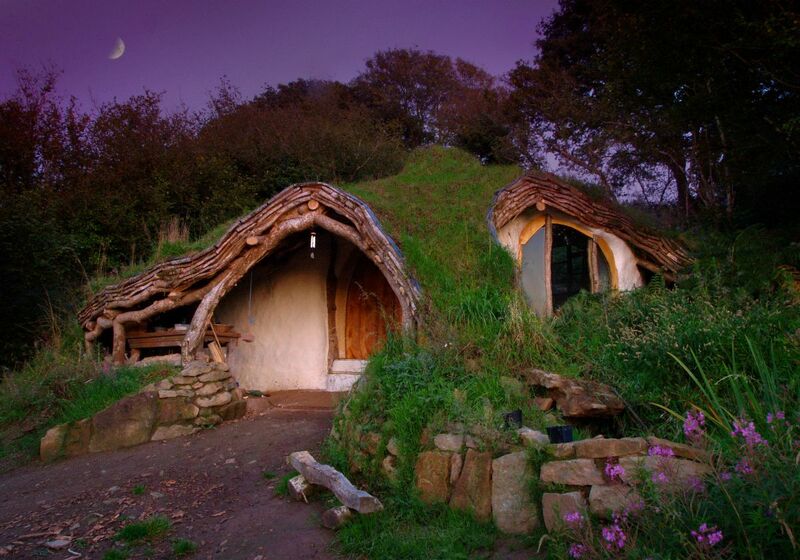 In a pioneering eco-village in Wales, he constructed a home that closely resembles the dwelling from Tolkien’s fantasy novel The Hobbit. The home that Dale, his wife, and his two young children occupy only costs £3000 (almost $4,000) to build and took Dale four months to complete. The house hugs the hillside, protecting it from bad weather. The frame is made of spare oak recovered from a local forest. The floors and fittings were repurposed from scrap, further reducing the home’s environmental impact. The structure is insulated with straw to make it more energy-efficient. While extremely low-impact eco-village homes like this may be very difficult to implement on a global scale, they set a precedent. They show that building homes of this kind is, indeed, possible. As the population grows and climate changes makes environmental conditions on Earth less predictable, humans could be pushed to seek shelter elsewhere. In fact, the prep work is well underway — for decades, we have been scanning the skies for signs of planets that could host human life, testing the surface of Mars for signs of water, and building rockets so large they could send 100 people to Mars in one go. The Moon seems to be the closest stepping stone for further exploration, according to a group of space experts. People haven’t set foot on the Moon since 1972, but they may do so again soon. Overcoming the harsh conditions on the lunar surface to create a permanent base is not an easy feat, as the Moon isn’t exactly hospitable to human life. A single day (and night) lasts as long as 14 days on Earth (a complete day is just over 29 Earth-days long). The Moon has little atmosphere, giving humans no breathable air and allowing temperatures to fluctuate to dangerous extremes — average temperatures climb to 123 degrees Celsius (253 Fahrenheit) during the day and dip to -233 degrees Celsius (-387 Fahrenheit) at night. Showers of energized particles batter the landscape on a regular basis, making life on the Moon arduous and difficult. Instead of building a base on the lunar surface where it would be vulnerable to the brutal conditions, we might want to construct a habitat inside recently-discovered lava tunnels. These massive cavities would be structurally sound and large enough to house entire cities, according to Japan’s Aerospace Exploration Agency (JAXA). 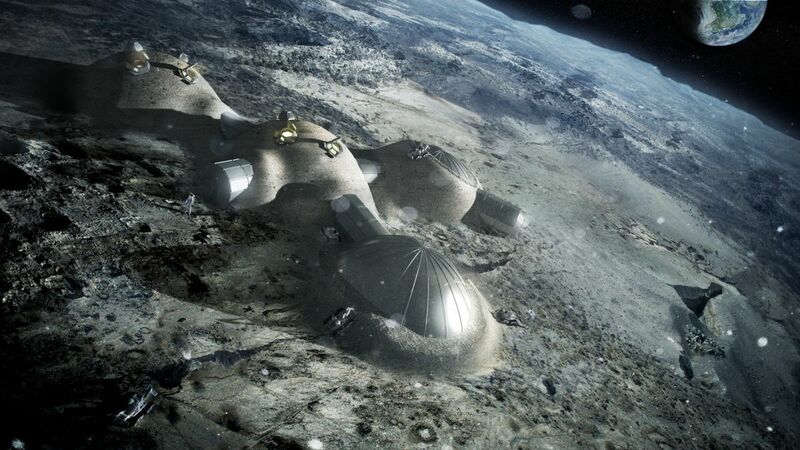 At the 2010 Global Lunar Conference in Beijing, scientists devised a detailed picture of what a lunar base could look like in 2050. Buildings would have to be dome-shaped to match the undulating lines of the Moon’s surface. “There will be a round dome inside [the lava tubes] from which we could see that the blue Earth is running in the universe with a great view of the midnight sun,” Bernard H. Foing, executive director of International Lunar Exploration Working Group, tells SSERVI (Solar System Exploration Research Virtual Institute). 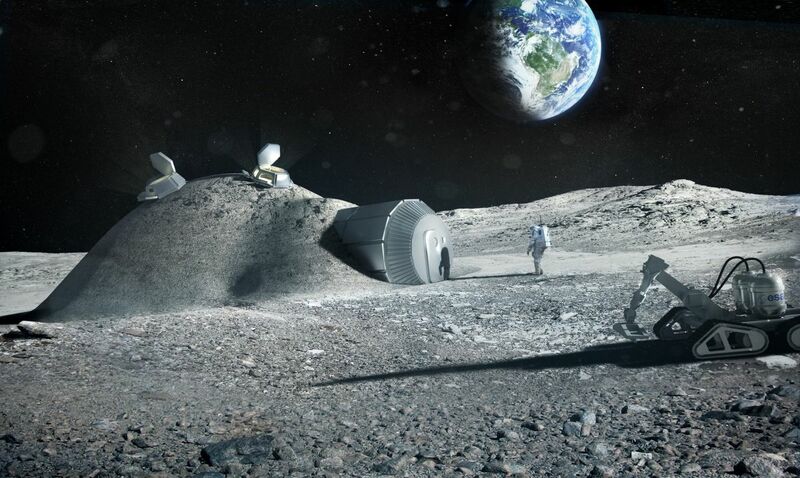 Jan Woerner, director general of the European Space Agency has his own vision of what life on the Moon could look like — the Moon Village. Though Woerner’s village was intended to be a concept of international cooperation, architectural design and engineering firm Foster + Partners rendered it into a fully-fledged 3D vision. The habitat is made up of a series of connected domes and is envisioned to be built near the Moon’s southern pole to maximize sunlight. Without an atmosphere to protect human inhabitants from meteorites and solar radiation, Foster + Partners’ vision uses locally-sourced materials to protect future inhabitants. Construction begins with a lunar lander, which holds two inflatable domes on board that serve as the initial outlines of the habitat. A robotic 3D printer then spends three months collecting Moon dust, scooping it layers of carefully interwoven dust to form a foam-like protective layer around the inflatable dome. The completed structure can house up to four people. Establishing a lunar base might only the first step as humans push further into the solar system. Mars has long captured the public imagination, and private and government-funded space agencies are working to send manned missions to the Red Planet. There are still many hurdles to overcome before putting a permanent home there, however — Mars has an atmosphere of mostly carbon dioxide, frosty temperatures, and powerful dust storms. In 2015, NASA launched its first 3D-Printed Habitat Challenge Design Competition, challenging participants to develop Martian homes that take advantage of local resources and 3D printing capabilities. 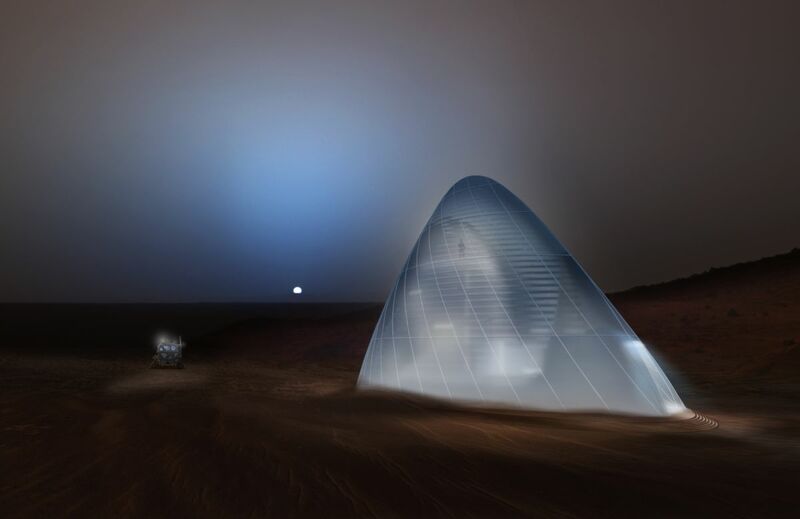 Team Space Exploration Architecture and Clouds Architecture Office won first prize for designing the Mars Ice House, which uses a 3D printer to wrap the structure in a thick layer of ice extracted from the Martian surface. The ice shell forms a blanket around a central “Transit Habitat” — a two-story structure transported to the Martian surface from Earth. The space between the ice blanket and the exterior of the habitat form a buffer, protecting its occupants from the harsh elements of the Martian surface.